“History is written by the victors” Winston Churchill. 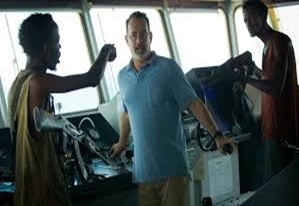 I watched Captain Philips recently and I walked away from the movie with a sense of betrayal. Like Black Hawk down, it was Hollywood style propaganda for the mighty of the United Sates. It is disheartening to watch helplessly how Somalia has become a punching bag for Western film makers. I guess they got tired of stereotyping the hooked nosed Arab Sheikhs and their petrodollars and harems, and are now looking for other stereotypes: enter the Somali villains who always end up being taught a lesson by US special forces. Unlike Black Hawk down, Hollywood this time employed real Somalis to play the part. Strangely enough, Barkhad and the other Somali actors delivered a riveting performance although their conversations in Somali sounded unscripted and impromptu. I wonder if they were given a free hand in the choice of the Somali phrases such as “Qabriga u dir”, send him to the grave etc. Nevertheless, they were witty, hilarious and credible. A plus for the movie is its fleeting hint at the existence of powerful warlords behind the piracy. This fact comes out when the chief pirate boasts of securing seven million dollars from a past hijacking and Captain Phillips asks him: “What are you doing here then?”. Although Churchill said that “History is written by the victors,” this movie is about History being written by the rich and powerful because the US always came out short when it comes to Somalia. The recent Barawa debacle is testimony to that. Modern wars are not about bravery but about the size of destructive power on hand. Somalia lacks such destructive power while the US has plenty of it. Therefore, Hollywood will continue portraying Somalis as a punch of skinny, rowdy and ill-clad savages who end up dying at the hands of elite US forces. If that reminds you of old black and white movies about cowboys obliterating semi-naked Red Indian savages, you got the right picture. Despite the negative portrayal of Somalis in the movie, one can only admire the tenacity and courage of the young pirates who push themselves to the limit in order to board huge ships with improvised hooked ladders and speeding boats. If such energy and innovations could be diverted towards the pursuit of education and productive work, Somalia could have been among the leading nations in Africa. A country that managed to create one of the strongest armies in the continent and contributed a lot towards the liberation of African colonies such as Mozambique, South Africa and Zimbabwe, managed to destroyed itself through superficial clan differences fueled by regional countries such as Ethiopia and Kenya. The recent release of the documentary “Not yet Kenyan” by Aljazeera will make many Somalis reassess their attitude towards Kenya. They will wonder what the Kenyan troops, who committed these atrocities against their fellow Kenyan Somalis in Kenya, are capable of doing in Kismayo and other Somali areas under their direct control. It appears that Somalia has a long way to go if it is to reclaim its rightful status in Africa and the world. Meanwhile, we will keep witnessing movies like Black Hawk Down and Captain Philips as long as we are saddled with mediocre national and regional leaders whose lack of vision and nationalism will only make matters worse and embolden the enemies of Somalia, both local and foreign. We should also be prepared to be exploited shamelessly by greedy oil companies that will destroy what is left of our pristine beaches and grazing lands. All our current leaders are in a frenzied race to sign away concessions to third-class companies that care the least about the environment and the livelihood of poor nomads. Until we find the right kind of leaders, we might as well sit back and grudgingly enjoy the stereotypical movies of Hollywood that portray our people in the poorest of lights, and at the same time watch out for explosive-laden zealots who are intent on going to heaven and blowing us all to kingdom come.